We are all used to recycling things such as aluminum cans, glass bottles and newspapers. But did you know there a number of other household items that can also be recycled? Recycling has become a way of life for most American households. Although the practice is centuries old, it was not common in the United States until the last few decades. Many of us, in fact, can remember a time when recycling was a novel concept for most of us. All that began to change beginning in the 1970s. The first curbside-recycling bin is used in Missouri for collecting paper in 1974. In 1976 Massachusetts starts weekly multi-material curbside collection programs in two cities with the first ever residential recycling truck. By the end of the 1970s approximately 220 curbside collection programs are operating in the US. By 1985 approximately 10% of Americans are participating in nationwide recycling. Also in 1985, New Jersey passes the nation’s first universal mandatory recycling law requiring residents to separate recyclables from their trash. By 1995 America is at 20% nationwide recycling participation and by 1998 we are over 30%. In the early 2000s, organic waste collection at the curb begins on the West Coast in San Francisco. In 2011, lawmakers in California adopt a goal to get the state’s recycling rate to 75% by 2020. Today, almost every municipality has the familiar recycling curbside bins and separating our trash for recycling has become an accepted and normal way of life. What many homeowners don't realize is that many other household items can also be recycled. For too many of us, our first thought when seeking to get rid of large, unwanted items, is to take them to the dump. But not only are landfills becoming scarcer, limitations on what can and cannot be disposed of have increased. But there are a surprising number of items that can either be reused or broken down and the components recycled. For example, you can recycle appliances at any recycle center that is equipped for them. If you find yourself with an old appliance that still works, but you don't need it or want it, you have a few options for proper disposal. You can try selling it online with sites like Craigslist or even eBay. You can sell it to a friend or neighbor, or even in a yard sale. Another option is to donate that working appliance. 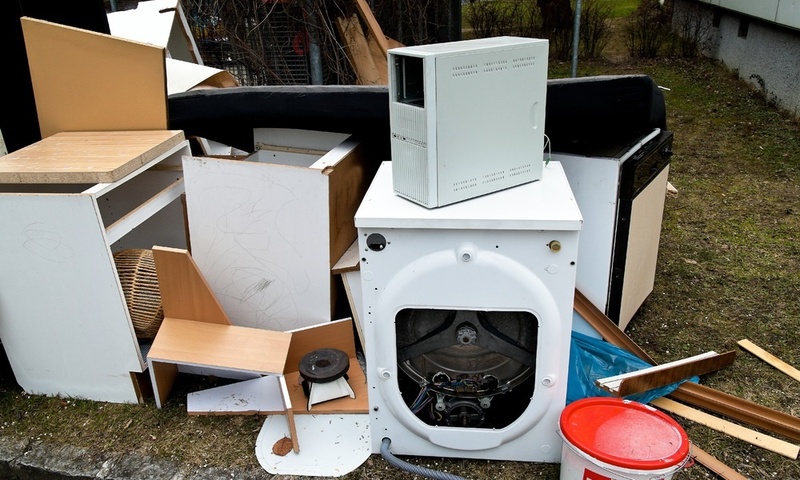 The challenge for many homeowners is how to get rid of those old, broken down appliances in a cost-effective and (hopefully) responsible manner? We've all seen the random sofa lying abandoned on the side of a road. Or even an occasional microwave or washing machine perhaps. This is not only unsightly, but it is potential hazardous as well as illegal in most places. You could take your old stove or refrigerator to the dump - if you have one nearby - but it is going to be a bit costly and they may not let you dump your old appliances there. A much better option in most cases is to give it away. There are a large number of non-profit groups, church or community thrift stores, and trash-to-treasure boutiques that would be glad to take them of your hands for free. Donating your used appliances can be a great alternative as many organizations will pick them up for you, saving you that chore. And, finally, if simply getting rid of an old appliance is your only concern, take note that there are businesses that will pick up your used appliances and then dismantle them for the usable parts and recyclable materials. This is an option that can benefit you by eliminating the work of lifting, hauling, and dumping your old appliance, not to mention saving you the disposal fees you would probably have to pay at the landfill or disposal facility. 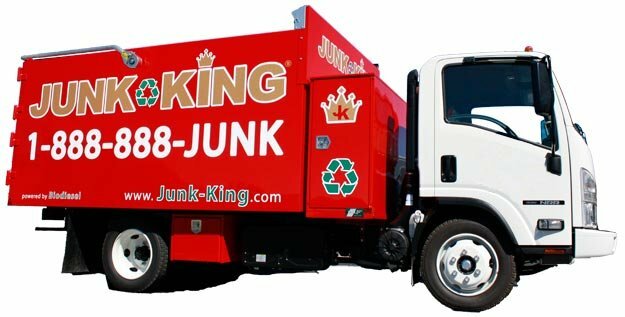 Junk King provides professional junk hauling services to remove refrigerators, freezers, ovens, stoves, flattops, dishwashers, ranges and more. We have all the equipment and man power to remove a large fridge even up a small stairway or down your basement steps out through the garage. We can remove commercial appliances if you are renovating a restaurant or upgrading your old equipment. Junk King will remove any household appliance that you deem unfit. Whether the appliance is broken or you just want to upgrade your equipment, Junk King can help you get it out of the way. We provide an eco-friendly appliance removal service to help you get rid of any unwanted washers and dryers, or any heating and cooling equipment. It’s as simple as 1, 2, 3. You make an appointment by booking online above or by calling 1.888.888.JUNK (5865). Our professional and insured appliance disposal team will show up at your home or office; we call 15 minutes before we arrive on site and we’ll give you a free estimate based on how much room your items take up in our truck. You point and we haul your old appliances into our junk removal trucks, with no hidden fees.